Apparently, I’ve been living under a rock because I just heard about this amazing event going on this weekend, February 20-21. 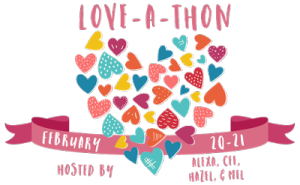 It’s the 2016 Love-a-thon where book bloggers, youtubers, and bookstagrammers get together for lively twitter chats, make new friends, contact with old friends, and so much more! To kick off the Love-a-thon, every participant is asked to answer a short questionnaire – so without further ado here is my first post for the 2016 Love-a-thon. I started blogging after my bookstagram account was a few months old. I realized that trying to write long captions in Instagram was not fun, especially when trying to review a book, so I decided to make a blog for book reviews. It’s so much easier to edit and have the word count as long as I want. I have a personal Instagram account with pictures of my children over on bookwormandmom. 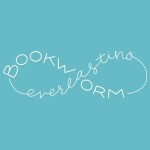 When I decided to make a bookstagram/blog I figured well, I am a bookworm, have been since I was 8, and I’m never going to stop reading, which sounds everlasting to me so, tada, bookwormeverlasting was created. I mostly read and review fantasy. I read a variety of other genres, but so far it’s mostly been fantasy. Right now, it’s mostly reviews, but there is a product recommendation, and a post about how I became a bookworm. I also have a personal post coming up about how my bookstagram got started. My best blogging experience so far is the creative outlet it has given me. I always thought of myself as a non creative person, but making a blog has made me realize there’s more to me than I thought. My favorite thing about the blogging community is the support. I have been a part of a lot of different communities and I have to say the book bloggers are by far the most supportive. The books I’m most excited for in 2016 are Glass Sword, Hidden Bodies, A Court of Mist and Fury, Lady Midnight, and Summer Days & Summer Nights. Five books I want to read in 2016 that I didn’t get to read in previous years are Illuminae, The Kiss of Deception, The Selection, Storm Siren, and Daughter of Smoke and Bone. An underrated series that I think everyone should read is the Covenant series by Jennifer L. Armentrout. Nikolai from the Grisha trilogy would be my bff. His sense of humor is similar to mine. We’d get along perfectly. Do I have to pick just one book boyfriend? I have many. Peeta Mellark, Miles Archer, Aaron Warner, Jamie Frasier…should I keep going? I would want Will Herondale, Tessa Gray, Celaena Sardothien, and Damen from the Captive Prince trilogy. That man can fight! Besides reading I spend a large part of time raising my three children. I homeschool my oldest and also have a two year old and a nine month old that keep me on my toes. I also love to journal. If I’m not book shopping then I am shopping for book merchandise. The DJ is playing my song and it’s Best Day of My Life by American Authors. I would love to see The Infernal Device series into a film! That would be beyond amazing. My dream library would have floor to ceiling shelves all around the entire room with a ladder. I would love to meet Mark Lawrence or Brent Weeks. Their books were the first I read that weren’t my usual cute and fluffy kind of story. They were brutal, raw, ugly, and violent – and I loved it. Very nice to meet you, Samantha! Jamie is also one of my book boyfriends… seriously love him! Thank you so much! Nikolai is such a hilarious character. I could hang out with him all day. Hi, Samantha! I was just in San Diego from Wednesday-Friday this week for work! Nice to see another SoCal Blogger! I’m in LA though and the drive back yesterday was a bear! BTW I love The Infernal Devices, too! Didn’t much like TMI, but TID?! EEEEE! Would love to see that as a movie or TV show! I must have been living under the same rock because I only just found out about Love-A-Thon too! I need to check out the Covenant series now. The more blogs I visit, the more my “must read” list grows. Lovely to meet you, Samantha! We have the same bookshelves 🙂 I see that you want to read The Selection series. It’s really fun! Not amazing (at least, not for me), but I super enjoyed it when I binge read the entire thing last month. Glad you joined us for this year’s love-a-thon, and hope you’re having fun! 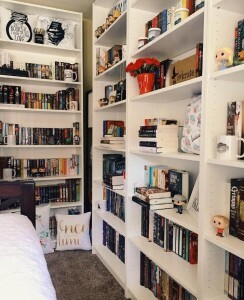 Your bookshelves are beautiful!! Totally read Kiss of Deception. I really enjoyed it!